Are you receiving 835 data that you and/or your staff are required to review, validate and manually post? What if there is a better way? DIS Technologies has long recognized the need to improve, clarify, enhance and enrich many of 835 remittance data advices received by physicians, hospitals and health care professionals today. Originally designed for the Practice Management System requirements of posting remittance information at the service line level the 835 ICEE is being utilized across the spectrum of health care providers in reducing labor costs by significantly eliminating hours spent in manually reviewing, validating and posting of their 835 incomplete information. 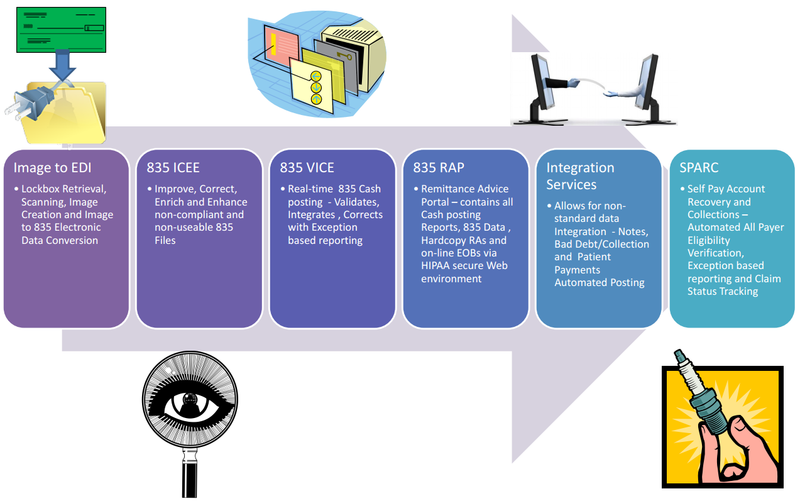 835 ICEE is customized to client specific operational workflows and configured based on collected business intelligence. The 835 ICEE results are designed to work seamlessly with current cash posting operations and should not require any modifications or programming changes to existing systems. Clients have reported 835’s that were only posted manually that now achieve over a 90% successful post rate. For those 835’s that suffered a high level of failure to post (approximately 70%) with 835 ICEE the client is now able to post in the high 95% +. If you are struggling with account level payments needing to be posted to the service level, secondary/tertiary payments needing additional information or image to 835 data that is incomplete and fails to post automatically sign up for 835 ICEE and see the difference we can make for your business processes. Our approach to data integration is based on the simple principle of “Trust but Verify” this is particularly held in high regard in building our 835VICE Remittance Advice Posting solution. From the daily deposit log to each individual payment and adjustment we institute a check and balance validation process that ensures the integrity of the data we are working with is accurate and the integration of the data is as precise as possible. Due to the high visibility of our efforts, the potential for significant down-stream processes being compromised and the reliance of financial data throughout the organization we strive for 100% accuracy of all 835 information we post to the right account, financial class, insurance plan and all financial information is correctly applied to the account as expected. Additionally, our reconciliation processes are established before, during and after we run our 835VICE service to ensure the veracity of our activities. Our Remittance Advice Posting processes are infused with preemptive logic and mission critical services providing superior results; simply put, our high level of customer service and quality of our product sets us apart from competitor’s inferior product lines. 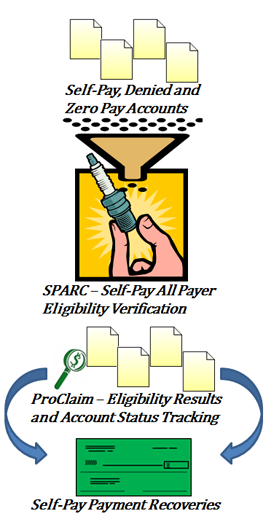 Upload the file to DIS for real-time SPARC Eligibility Verification. Receive a full report with the results accessible via ProClaim, a Web-based reporting and automated account follow-up application. Submit to Payers all Eligible and reviewed results for payment. Automated Real-time – integrated at the point of registration or admission, information is directed between systems and thus requires no direct involvement from Provider personnel. Batch Verification – service is driven from internal or external source of information and can be scheduled for daily, weekly or monthly checking. On Demand – through our ProClaim web service portal users can make requests as needed and information is returned and stored in our on-line environment. All results from our services are available in our Proclaim web service portal and all information as provided from our services can be integrated into your PFS system as needed. One of the biggest advantages of our solution is the infusion of intelligence for our eligibility verification process. We evaluate the results from Payers and based on those results can determine success, review or failed eligibility as based on payer specific rules set forth by our partnerships with clients. Moreover, with our ProClaim web service customized user work-queues are set up for Eligibility results follow-up. ProClaim provides enterprises access to our SPARC results without the need for hospital-based client software or server hardware. Our HIPAA compliant web based service allows your facility to enjoy all of the advantages of the eligibility verification process, while avoiding a substantial upfront hardware and software investment.